The Kimber Ultra Elite is a compact 1911-style handgun manufactured by Kimber America. The Kimber Ultra Elite shown below has a blued frame and a stainless steel slide and barrel. The Kimber Ultra Elite is a very compact firearm that proved to be a popular handgun for the Kimber company. 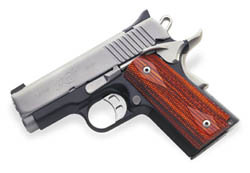 Currently, Kimber makes several models in the Ultra line in both 9mm and .45 ACP.